Of all the gastronomic delights one can experience around the world, afternoon tea in Hong Kong remains one of the quintessential “must do’s”. That colonial tradition continues to flourish as a beloved afternoon ritual, at the most luxe of hotels to trendy new cafés. 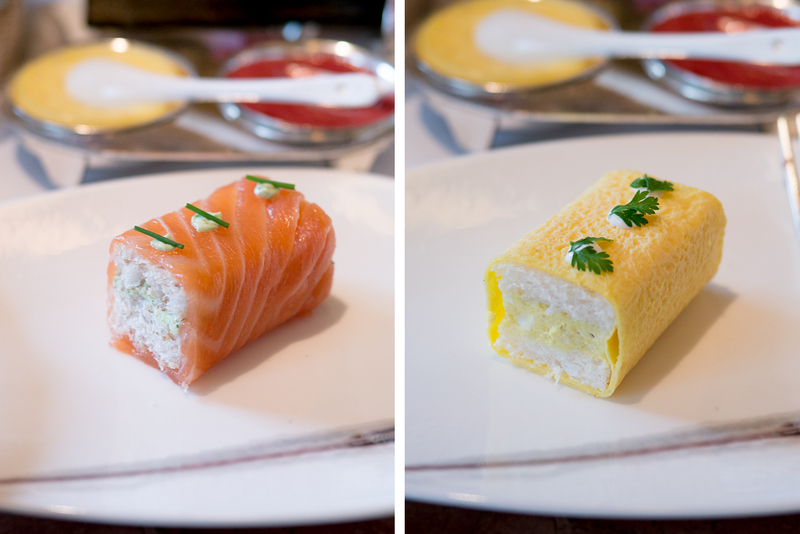 Hong Kong has long been a culinary melting pot, taking tastes from around the world and giving them a shiny new twist. 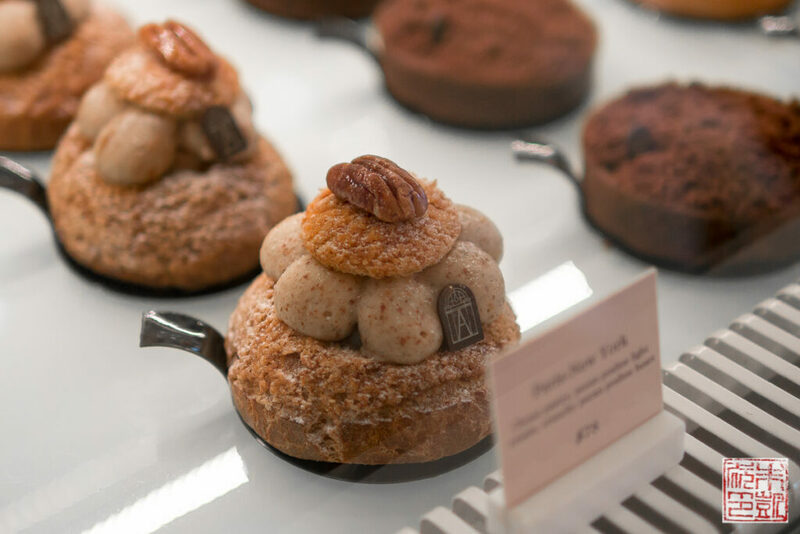 From French macarons to Japanese cheesecake to American cupcakes, I’m always delighted to see how food trends get interpreted through Hong Kong’s discerning lens. Afternoon tea proves no exception. Following are all the tea salons I visited during my oh-so-short stay in Hong Kong; hopefully they’ll give you a tiny taste of the myriad ways to take tea. Afternoon tea at the InterContinental Hong Kong is the perfect encapsulation of refined luxury: It’s hard to surpass sipping a hot cup of tea and nibbling on scones in front of an absolutely breathtaking panorama of Victoria Harbour. 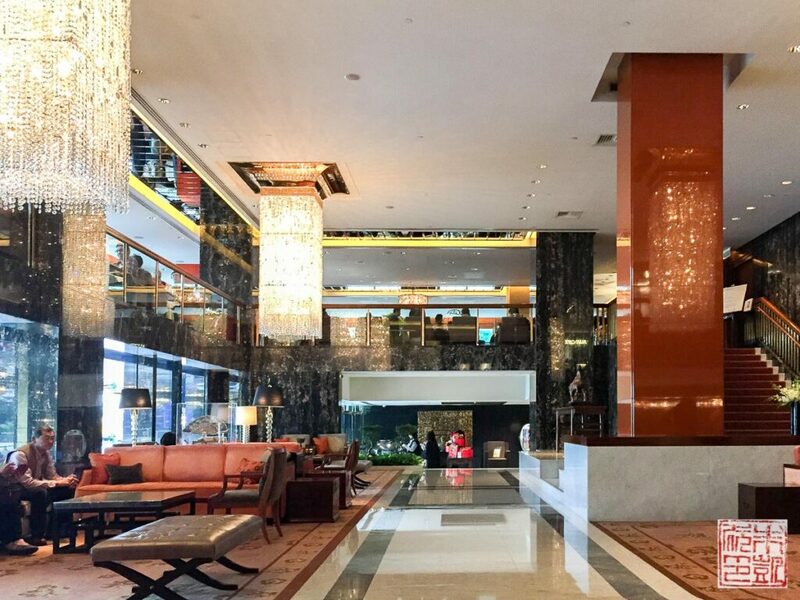 The shining star of the hotel’s Lobby Lounge is the unbroken sweep of skyline and water through an impressive wall of floor to ceiling glass. Watching the buildings illuminate one by one as dusk falls while gently glowing ferries ply the waves is a memory I’ll long savor. The Lobby Lounge offers multiple options for tea; their most unique is the Red Box, a tea set inspired by traditional Chinese sweet and savory dim sum. In the interests of having as wide a variety of tea experiences as I could, I tried the Red Box, although I’d love to go back to try the other ones. 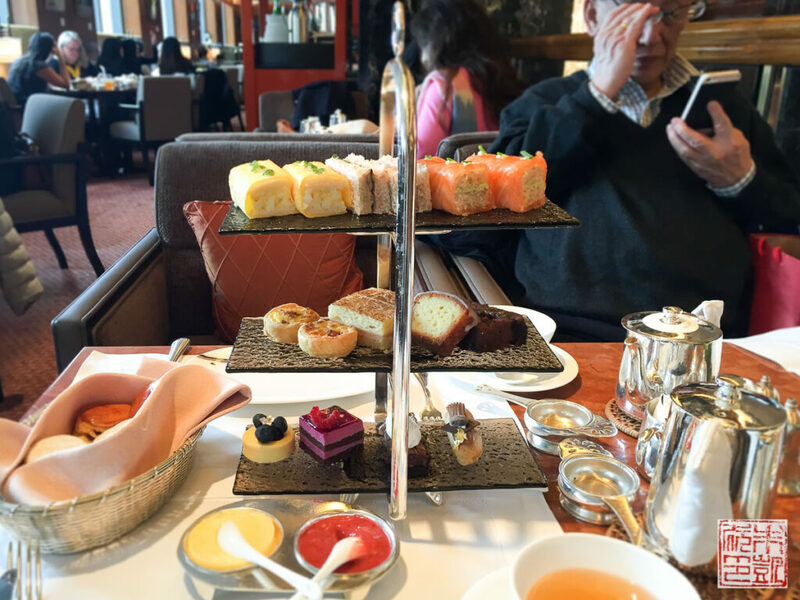 The InterContinental in Hong Kong has a fully developed program for the discriminating gourmand, from two Michelin-starred restaurants to cooking classes taught by hotel chefs, so I was prepared to be impressed by their afternoon tea. The three layered deep red lacquered box makes a dramatic presentation. All the items have been created by the same kitchen team behind the InterContinental’s two starred-Michelin restaurant, Yan Toh Heen. 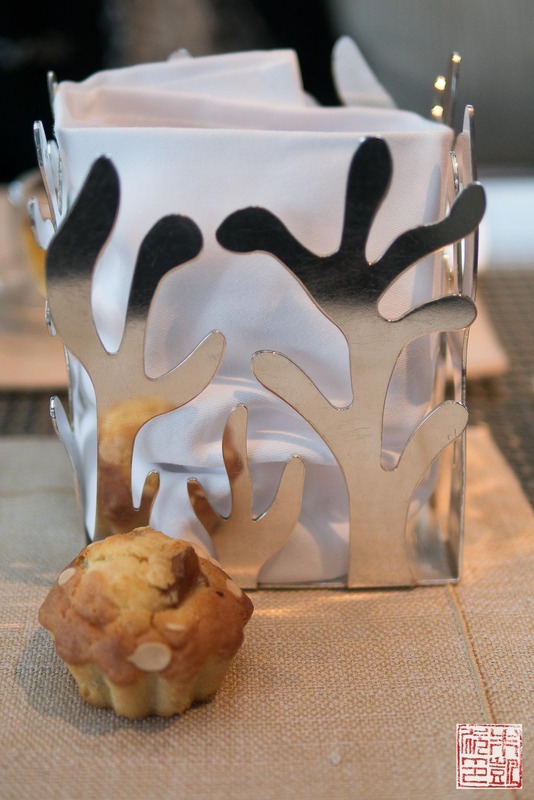 I loved their modern interpretations of classic Chinese dishes, presented jewel box-perfect for tea. Instead of traditional scones, a basket of dried longan and goji berry madeleines is offered. 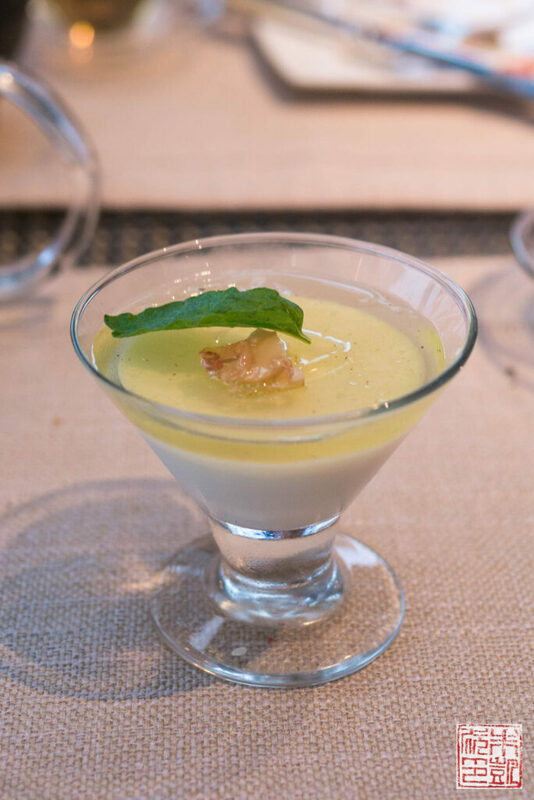 The top level of goodies is the most luxurious, offering up bites of golden crab claw filled with minced shrimp, foie gras and chicken pastry, and braised abalone and black mushroom tart. Three lovely, sublime bites and some of my favorites out of the entire set. 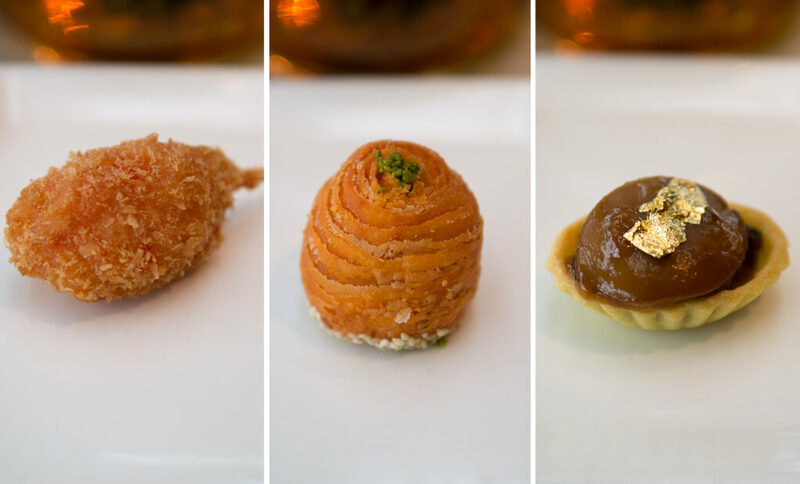 The second layer includes traditional Chinese baked savory items including a miniature barbecued pork bun, minced pigeon puff pastry, and a spinach, ham, and dried scallop filled pastry. Dim sum aficionados know that freshness is key to good dim sum; no matter how well it’s made if it’s old or cold it loses much of its appeal. Because of this, there are only 20 sets of the Red Box prepared fresh every day for afternoon tea, in order to maximize their quality. Those in the know will line up at the lounge before tea service begins to ensure a better chance at snagging one of the sets, as they sell out quickly. I’m glad I got a chance to experience this coveted box! The sweets in the final layer of the set are riffs on classic Chinese dessert items like nuts, taro, and fruit. 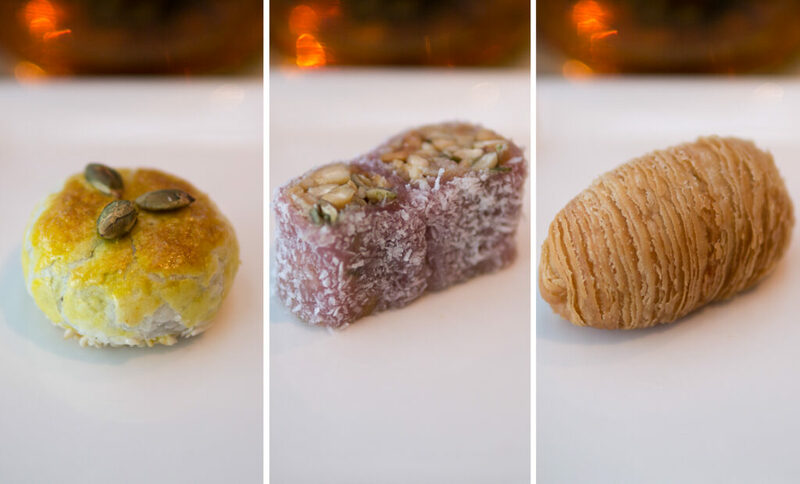 There’s taro and salted egg yolk in puff pastry, a roll of candied nuts, and a mango and green bean dumpling. It’s a departure from the traditional European-style desserts like cakes and cookies, but perfectly fitting with the theme of the set. They follow the Chinese preference for sweets that are not overly sweet, but are light and refreshing instead. The set also includes a sweet almond and osmanthus flower pudding as a palate cleanser, which I loved. Its silky sweetness is a lovely ending to the tea. 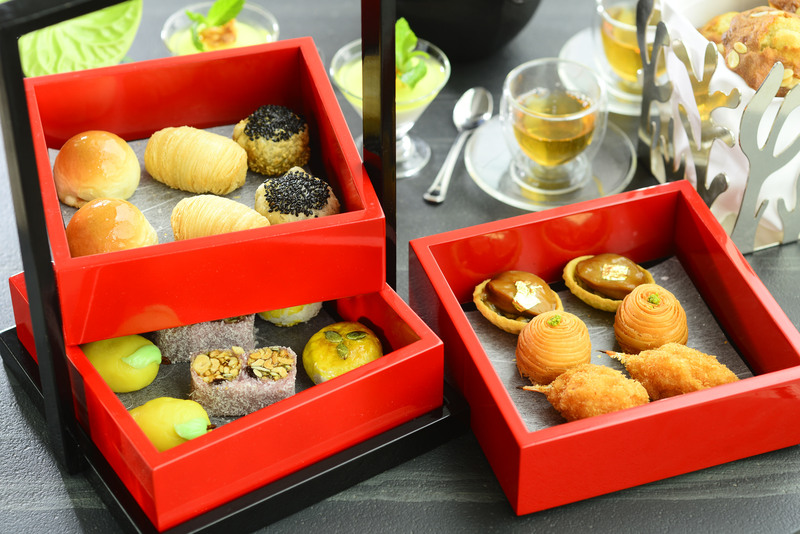 The Red Box tea set is the only one produced by the Yan Toh Heen team, while the other tea sets are created by the InterContinental’s executive pastry chef, Cyril Dupuis. When I expressed regret that I wasn’t able to try any of his creations, they generously brought me one of his a la carte desserts, the Ispahan cake. 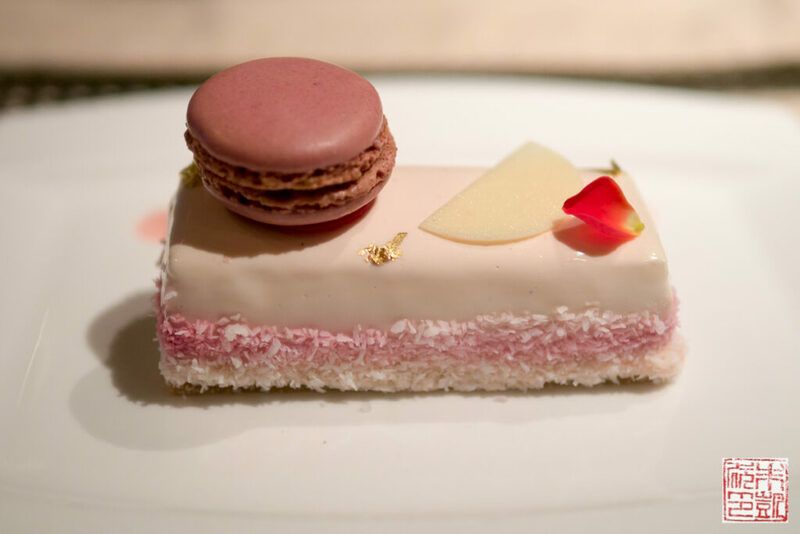 As chef Dupuis worked with Pierre Hermé in Paris, this cake is a lovely tribute to his culinary background, with a lychee mousse and rose petal cream layered over a coconut dacquoise base. The macaron is just, well, the cherry on top. 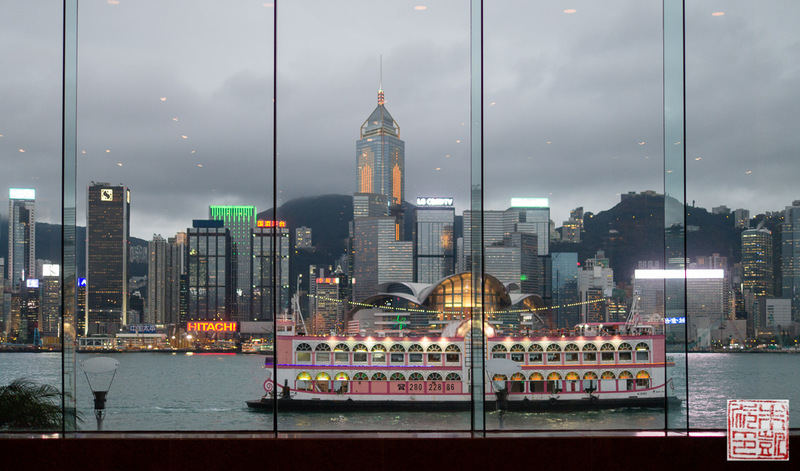 The Mandarin Oriental is one of Hong Kong’s most iconic hotels, and quite fittingly in their Clipper Lounge you can experience the epitome of high tea as perfected during Hong Kong’s colonial days. Both the lobby and lounge exude timeless elegance. Ensconced in a plush armchair, with my only concern the array of treats presented before me, I could fancy myself a lady who lunches, with the leisure to have tea in the finest of settings every day. A pleasant daydream, isn’t it? The afternoon set at the Clipper Lounge is a polished presentation, with scones and a three-tiered display of savory and sweet nibbles. 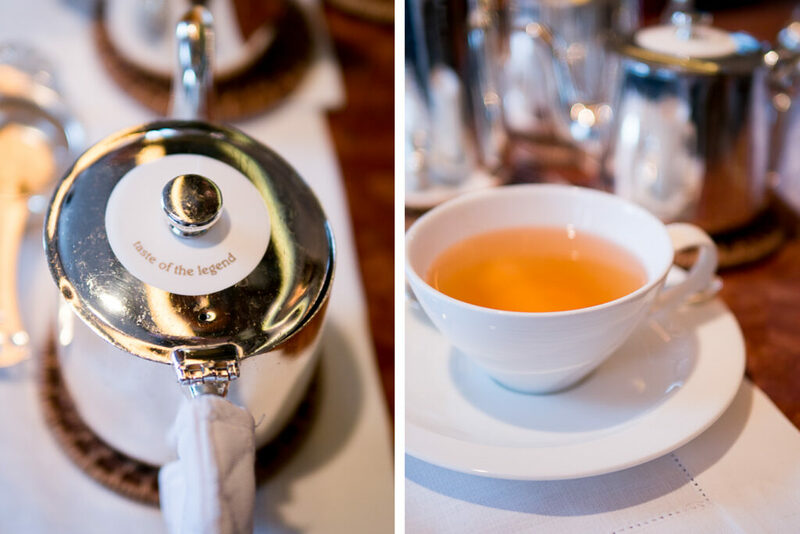 It’s served with your choice of tea; I went with the Mandarin Oriental’s exclusive Taste of the Legend, described as, “an exquisite oolong tea from China, that features subtly sweet spicy notes of vanilla and cocoa-caramel. Floral and orange essences deliver a rich aroma, as notes of citrus tease the palate.” An ideal accompaniment to the set. The scones, in classic and raisin versions, are fabulously warm and fluffy, perfectly tucked into their napkin-lined basket, and served with clotted cream and the Mandarin Oriental’s signature rose petal jam. Elegant two-bite sandwiches include smoked salmon with cream cheese, roast beef with horseradish, and egg salad. If you look at the photo above that’s a tea set for two, which comes with two of each sandwich. Along with other savories like a bacon quiche (a definite favorite for me) and a croque-monsieur, if you’re overindulgent at the top you might be struggling a bit by the time you get to the sweets! 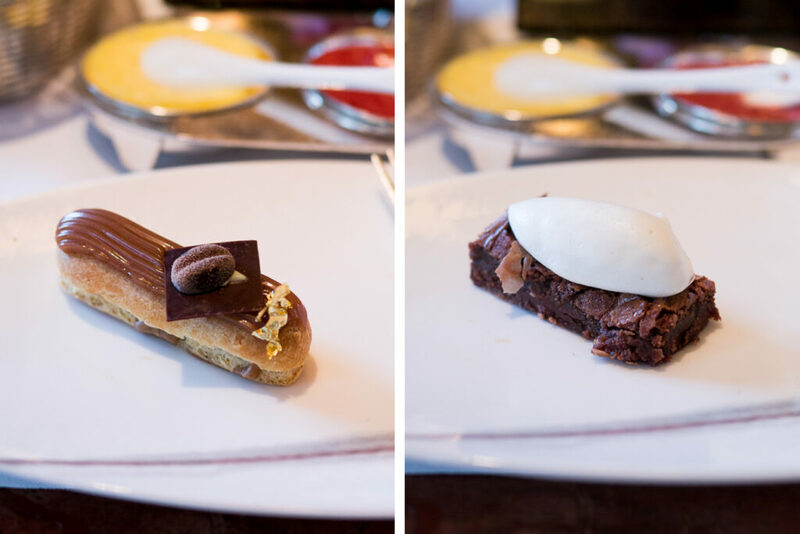 Not that I would have ever left this coffee eclair and chocolate brownie behind. 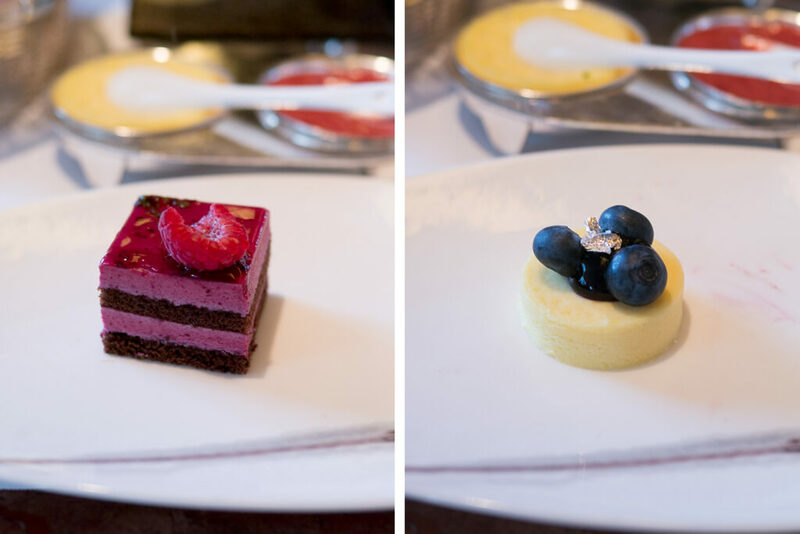 We rounded out the desserts with an ethereal cassis mousse cake and another Mandarin Oriental signature item, the blueberry cheesecake. They look tiny but they’re so rich that they’re actually just the right size to enjoy without being overwhelmed. Overall, an entirely serene and dreamy experience. TeaWood is a more casual but fun option for afternoon tea. 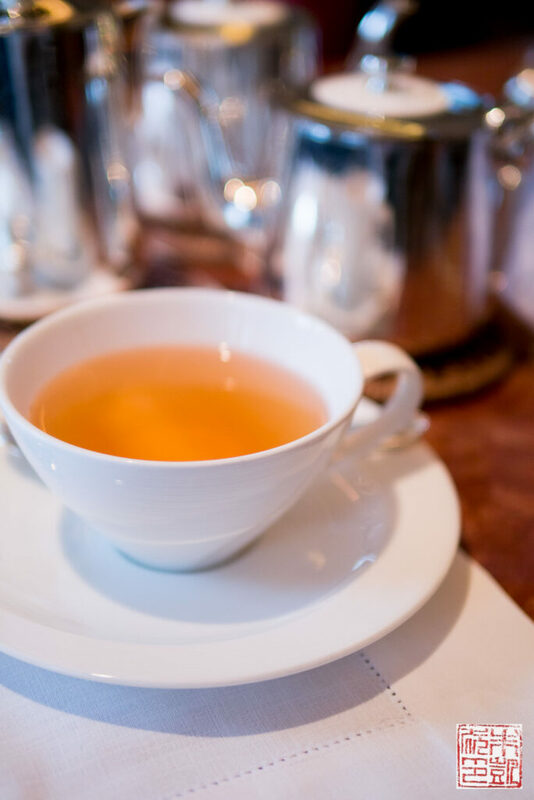 The nice thing about Hong Kong is there are infinite ways to enjoy teatime, from a totally luxe high tea experience, to a simple cuppa with a slice of cake in a cozy café. TeaWood is a Taiwanese chain that offers simple cafe style noodle and rice dishes, but is most popular as a place for an afternoon sweet stop. 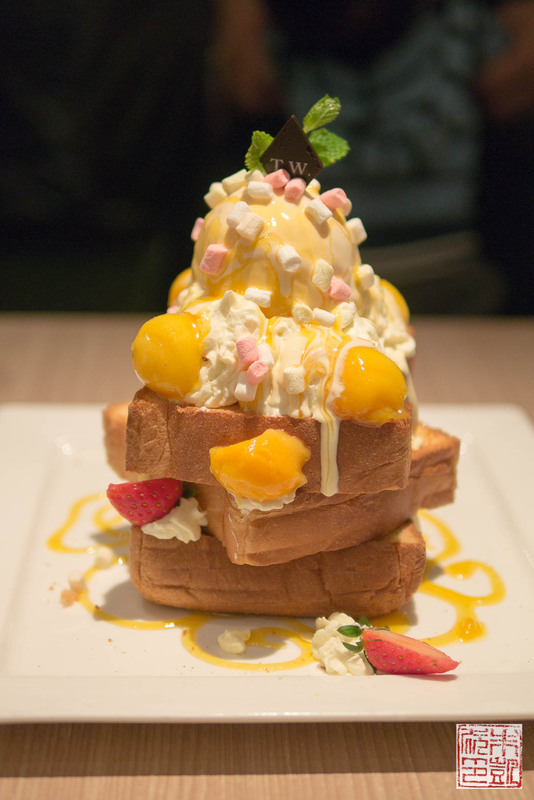 Teawood’s signature dish is honey toast: three thick slices of toast arranged in a stack and then covered in ice cream, fruit, and other sweet toppings for a photo-worthy display. The centers of two of the bread slices are cut into cubes for easier eating, so eating becomes a delighful exercise of spearing, swirling, and dipping. It’s definitely sized for sharing so bring a friend for teatime. 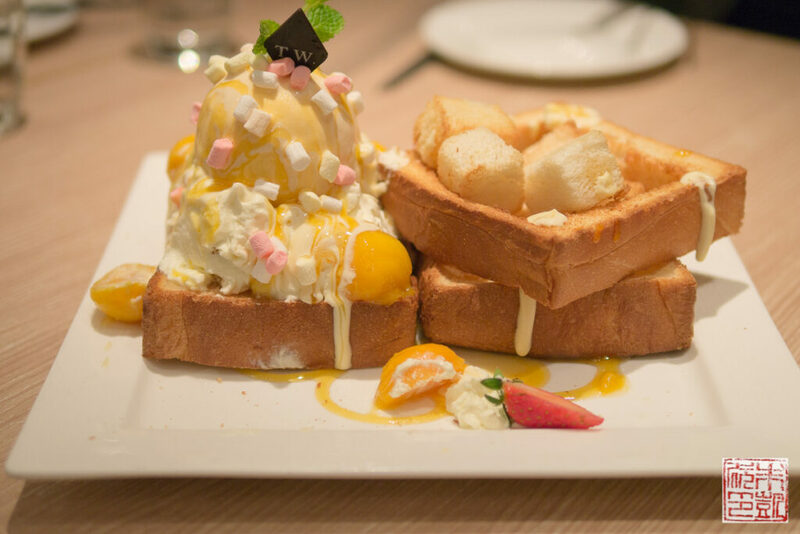 We had the Mango Vanilla honey toast, which was piled extravagantly high with mango ice cream, vanilla sauce, fresh mango and strawberries, and marshmallows. It’s ridiculously over the top but so good, especially when your blood sugar is low after a day of shopping (and in Hong Kong, shopping is truly a endurance sport). We had a pot of the longan and red date tea, but of course the iconic drink of Taiwanese (and Hong Kong) cafes is milk tea. 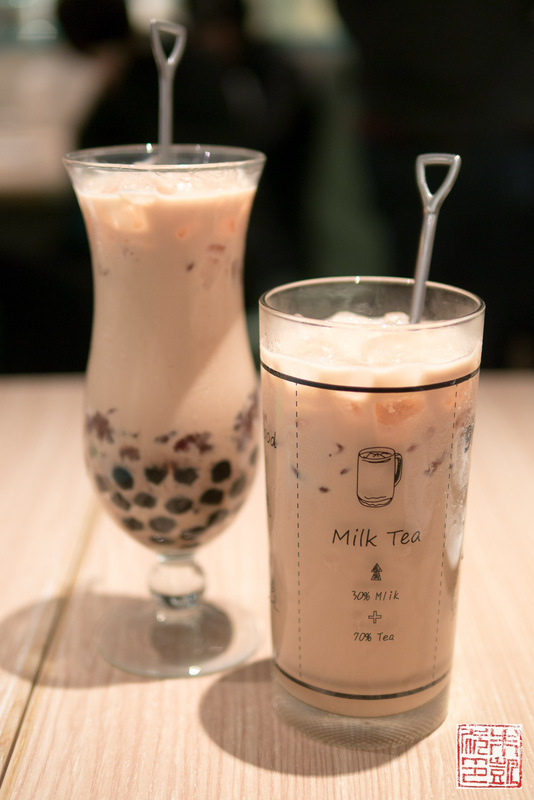 You can debate endlessly with milk tea fans about the proper way to drink it – hot, cold, with boba, without boba, but however you take it, it’s a must-try while in Hong Kong. My sister’s pretty oolong milk tea, served crema style, with a whipped cream topping. 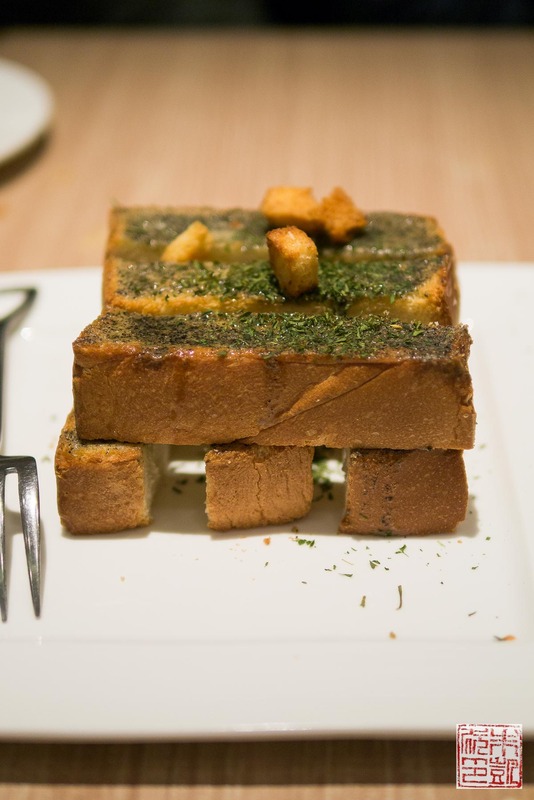 Finally, after demolishing the mango honey toast, we were still a little peckish but not hungry enough for a second toast tower, so we got the more modest sesame toast, which is spread with black sesame paste and has garlic bread crumbs on top. Yes, bread on bread. We certainly got our carbs’ worth at Teawood. A lovely addition to the cafe scene in Hong Kong. I didn’t get to experience this afternoon tea myself but my parents have and they said it’s definitely a worthy experience. 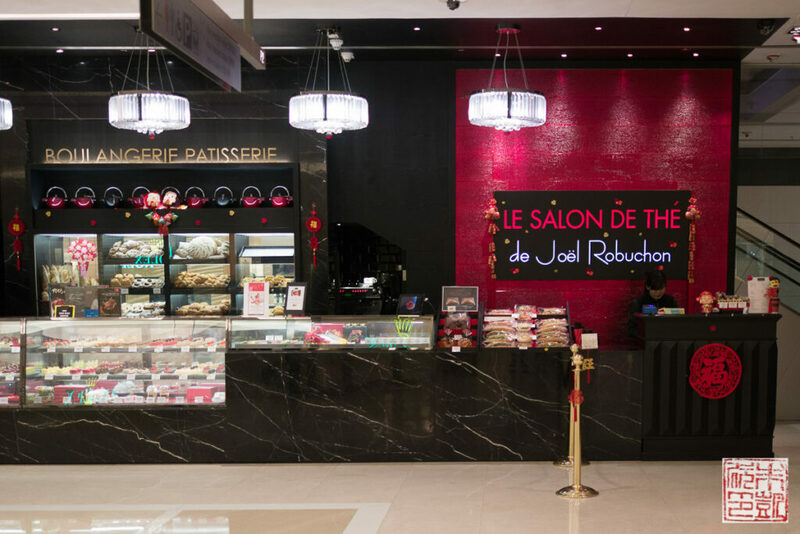 Chef célèbre Joël Robuchon has established a small empire in Hong Kong, including two cafés-slash-tearooms . 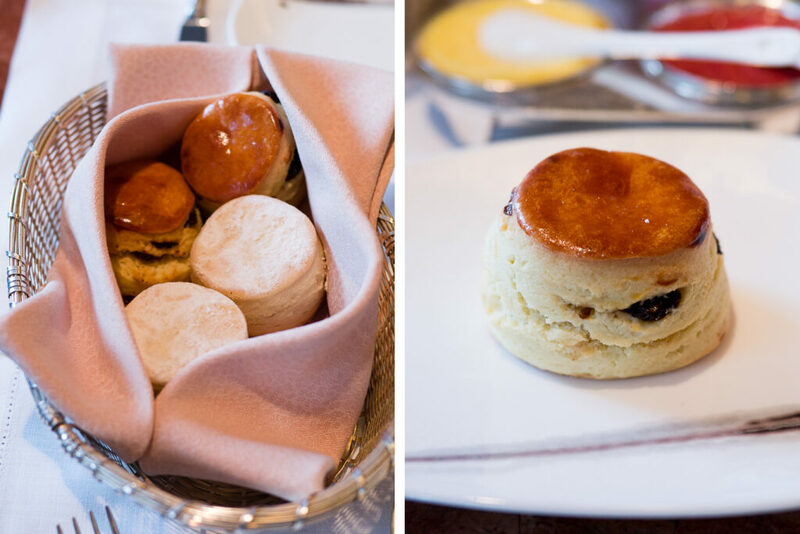 Alongside the requisite scones with clotted cream and jam, the tea set menu includes savories such as crab meat sandwiches with apple and beetroot, sardine rillettes, and foie gras with sweet corn. 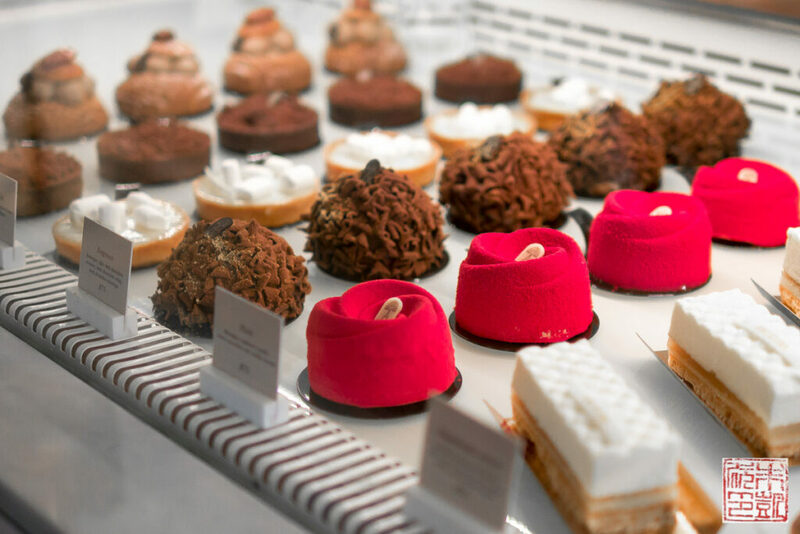 The sweets are definitely the jewels of the set, from a raspberry and cassis pastry, to miniature mont-blanc, to chocolate ganache macarons. 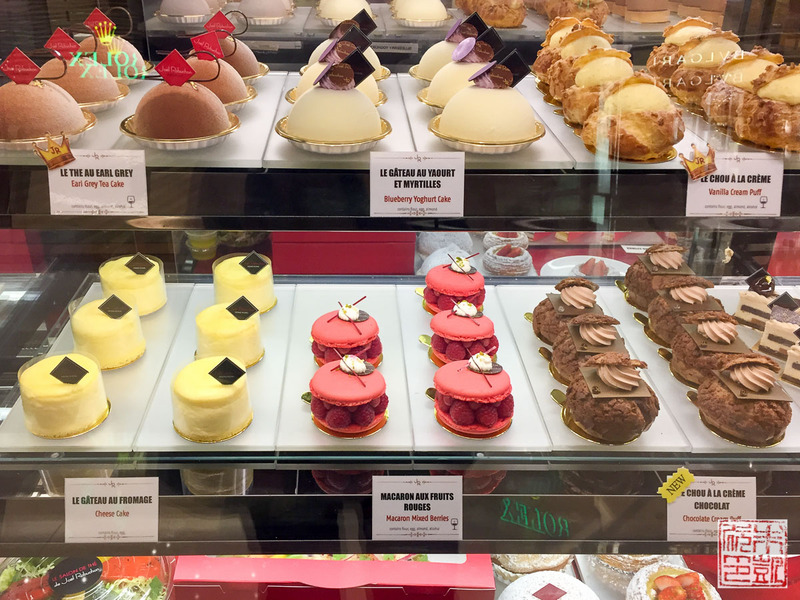 I’m envious that so much high end French pastry is so readily available in Hong Kong! 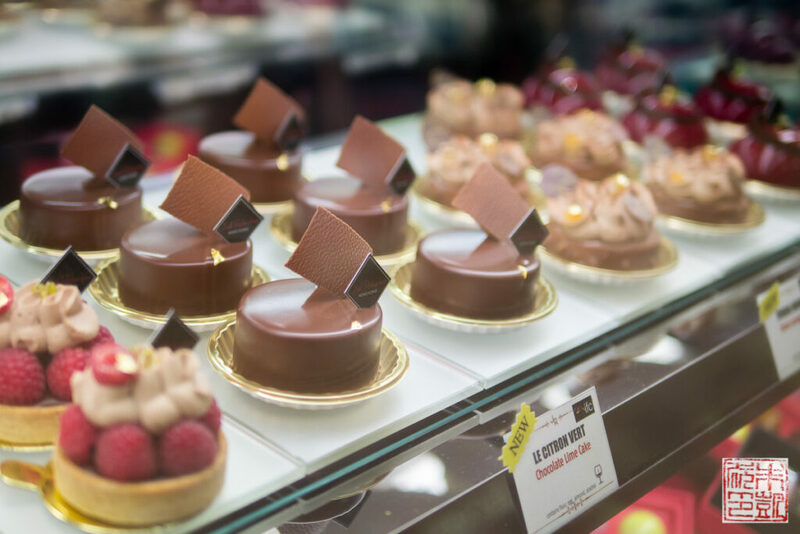 If you aren’t able to indulge in the tea set, there is a boulangerie-patisserie right next to the seating area, where you can stock up on croissants, macarons, chocolates, and pastries. I wanted to take the entire display case! 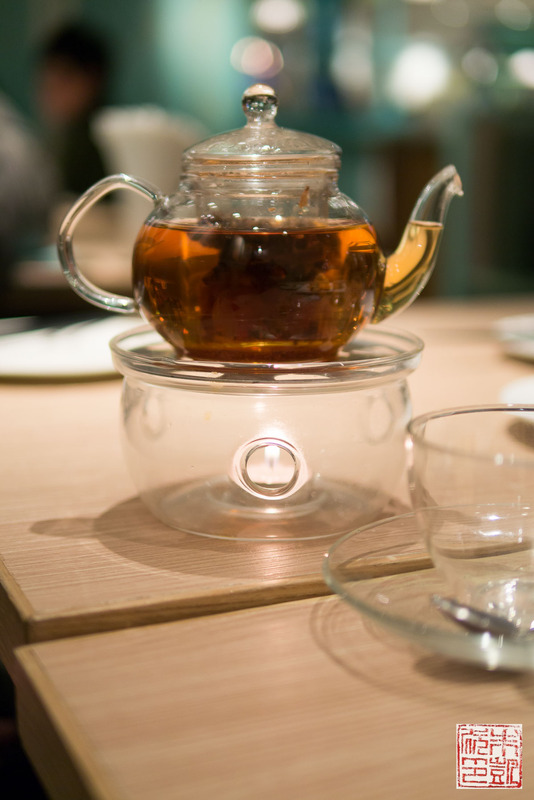 Joel Robuchon has two tea salons in the Central district; we went by the one in ifc mall. 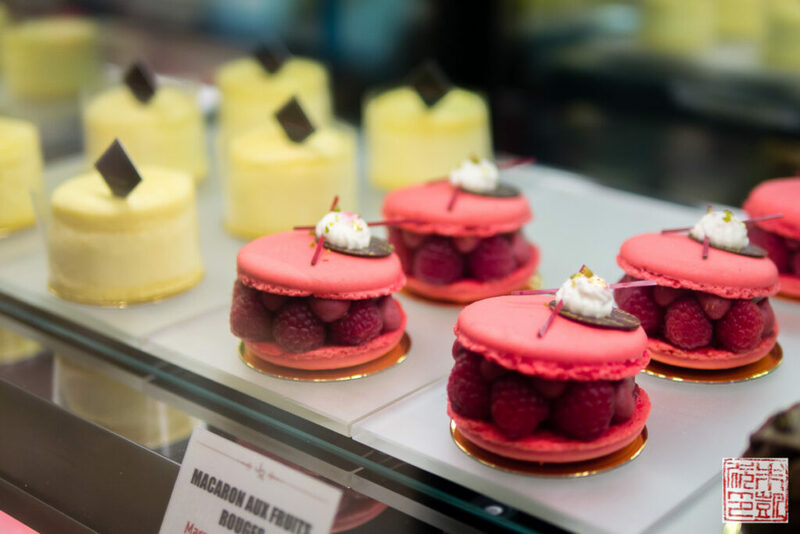 The classic raspberry filled macarons, along with other delights on display. The presentations are uniformly stunning. I honestly wanted to try them all and this place is first on my list of bakeries to revisit when I return to Hong Kong. 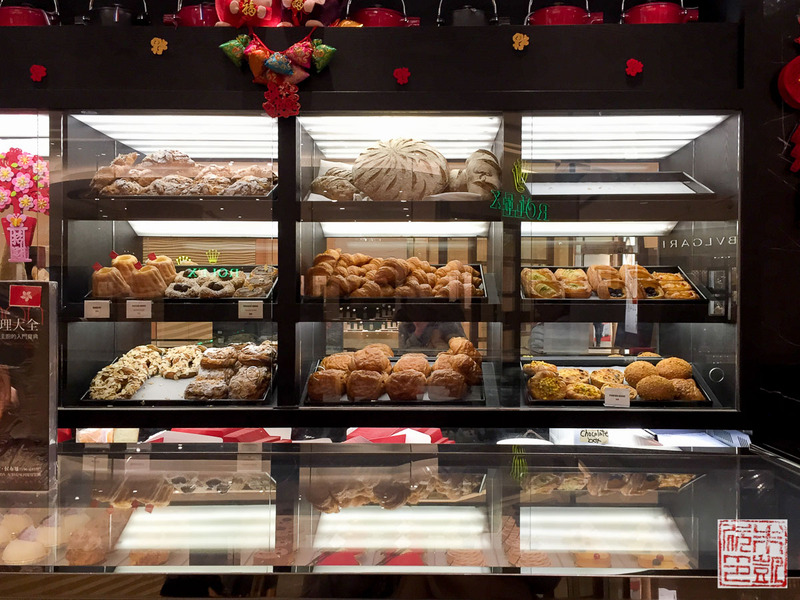 The amazing bread selection behind the counter. Between the breads and the pastries and the chocolates and the macarons, it was hard to tear myself away. 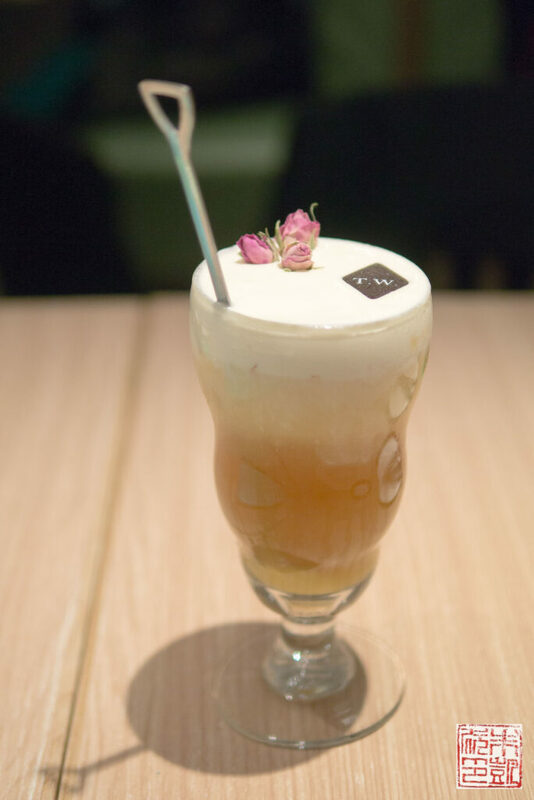 Along with two restaurants, Joel Robuchon has two tea salons and three patisseries in Hong Kong so try your best to stop by one of them – it’ll surely be a sweet highlight. 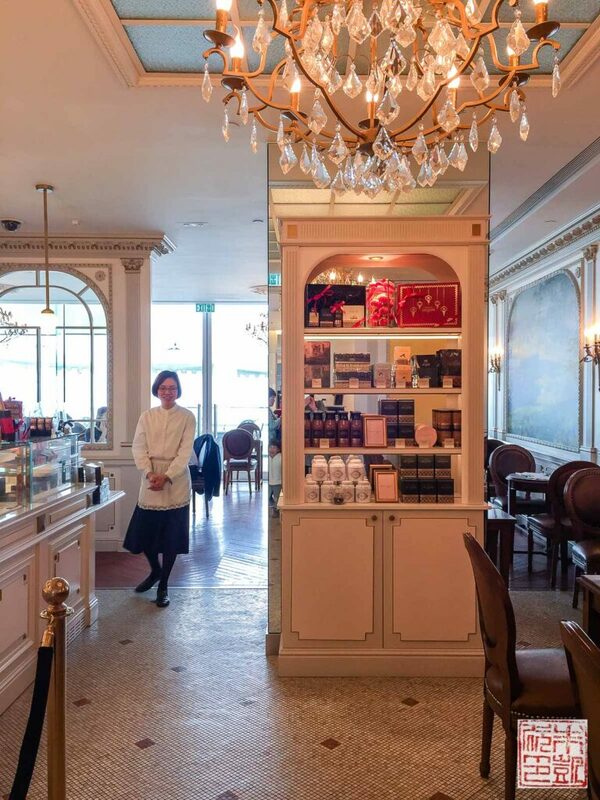 Angelina Paris is another French institution that’s set up a branch in Hong Kong. Angelina was founded in 1903 in Paris and quickly became a favorite of the salon scene. It remains a destination for locals and visitors alike today, and now Hong Kong has its own Angelina outpost. 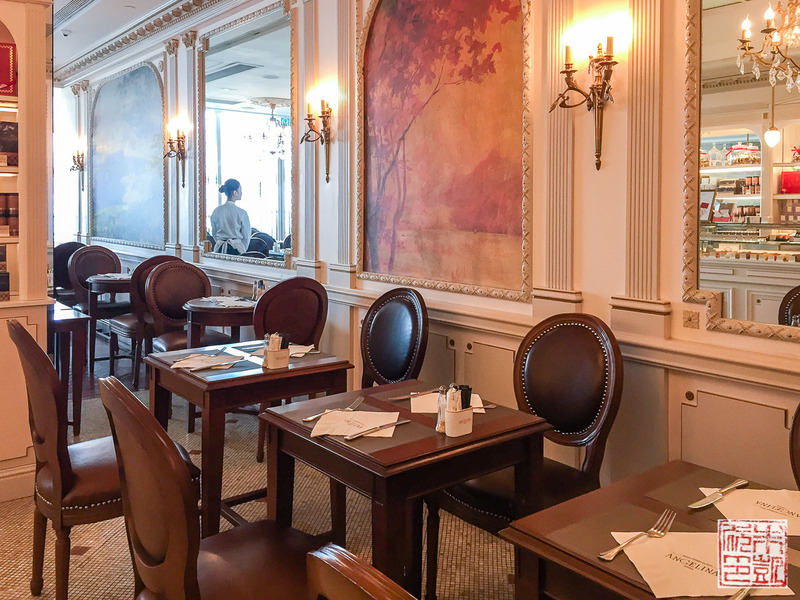 Tucked away in a secluded corner of ritzy Lane Crawford in the ifc mall, the white-and-gilt tearoom captures all the formal elegance of the Belle Epoque era and provides a picture perfect frame for the bird’s eye views of Victoria Harbour. The terrace definitely affords the most enviable views, but if you’re looking for a respite from the Hong Kong humidity, the glass-walled interior can give you the best of both worlds. 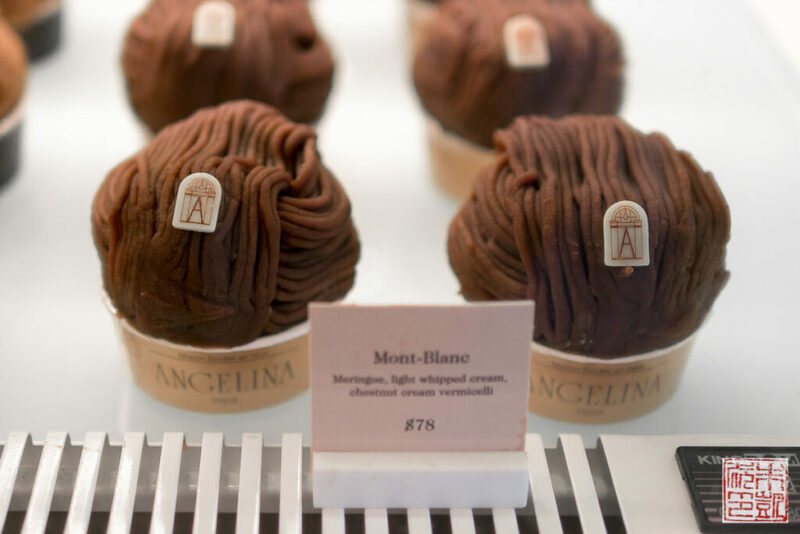 Angelina’s signature items include their hot chocolate (if you want a change up from tea) – the almost ridiculously thick Africain chocolate chaud, and their Mont Blanc, that French patisserie classic. A softly whipped mound of vanilla cream atop a base of feathery crisp meringue, covered with thin “vermicelli”-like strands of chestnut cream. I also fell in love with their Flore, a rose-red cakelet shaped almost exactly like…a rose. The velvety petaled exterior covers a filling of vanilla mousse with a raspberry center. The very definition of “too pretty to eat”. Angelina’s not above riffing on the classics, as shown with their Paris-New York, an updated version of the Paris-Brest which features a cream puff base filled with pecan praline pastry cream. It’s a perfect balance of crisp and creamy and sweet, like all French pastries. If you’re looking for an escape into indulgence, Angelina isn’t a bad choice. A cup of hot chocolate and a gorgeous pastry along with a million dollar view, will have anyone feeling like they’re on top of the world. Wow! Everything is so beautiful and elegant! What a cool experience! 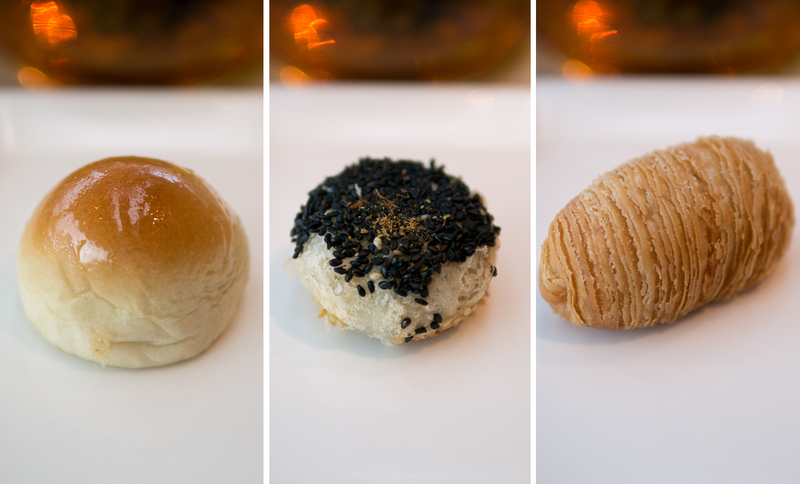 I love all of the little dim sum pieces! WOW!!! What a delicious looking spread. Thanks for sharing – I need to have an experience like this when I visit! This looks AMAZING! I love afternoon tea. I’m going to Shanghai and Beijing next month and I SO wish we had time ti visit Hong Kong as well. Oh my gods, they look amazing. I’m doing the afternoon teas here in Manchester. There’s so many, it’s gotten so popular.